Over the last year, I've not had much to add to my wardrobe and I want to reinvent it so that I have a pieces that will be great for both work and weekend style. It's looking a bit shabby at the moment and I want to inject colour, versatile prints and smart style into it. I also want my next pieces to be unique and fun. This week I found myself on the Romwe website looking for that uniqueness and fun I want in my wardrobe and finding it easily. Let me share a few of my favourites with you. I've always loved having bright colours and prints in my wardrobe but more than ever I need it to be versatile enough for work and weekends. I also feel like I need my style to be a playful smart look. It's one I think could sometimes be difficult to pull off but I can imagine it with some of these pieces I've picked from Romwe on my wishlist today. I can imagine the sunflower tee with a pair of high-waist green trousers and heels or that black pinstriped culottes with a plain white tee and a fun pair of bright flats. In my head they're pink or yellow. 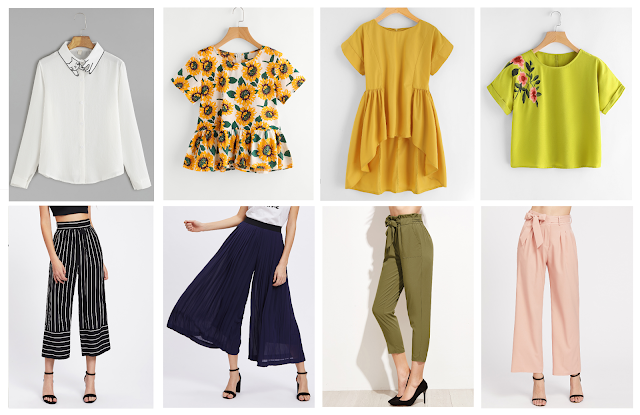 If I could only pick a couple of pieces, I'd definitely want the yellow dipped hem top and the pinstriped culottes most. I feel like they work with things I already have in my wardrobe now. But I do love all these pieces quite a lot and the price is really affordable too. I know from watching YouTube videos and reading blogs that Romwe can be a bit hit and miss sometimes, but I'd love to see what these pieces are like for myself. I think for the price it's worth giving it a go and seeing what you get! What pieces are your favourite? And have you shopped on Romwe before? I used to shop at Romwe, but I have kinda forgotten about them now! Oops.